Tennis – Malaysian Open Kuala Lumpur 2012 – footsteps……..
Once again tennis fans in Malaysia will be able to watch live actions of world class tennis players playing before their eyes. 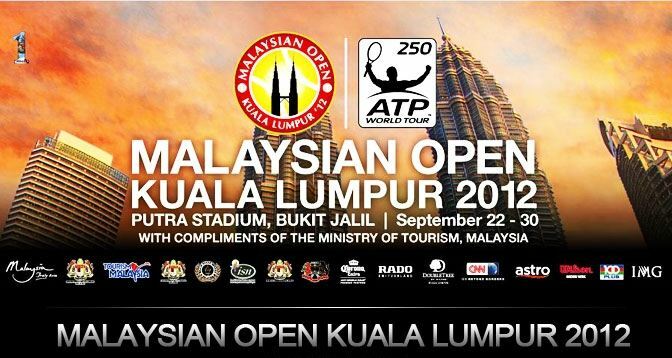 This event has been organised for a few years now at Stadium Putra in Bukit Jalil and if you are a sports fans specifically tenis, don’t miss this opportunity. Stadium Astro also conducts a contest where readers can win FREE tickets to watch the games. The tournment starts Saturday, 22nd september 2012 and the Finals on September 30th. See schedule HERE. Fans dan watch the games FREE from 22nd to 24th September and entry upon purchased tickets begins on 25th September. Go HERE for ticket pricing and Map. During the tournament, fans can expect to see great tennis players in action.